The world’s leaders pave the path to war—and to the rest of a war-ridden century—in this insightful interpretation of recent history. 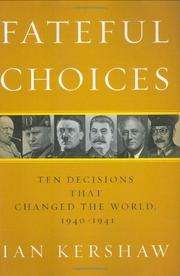 World War II, “the most awful in history,” and the postwar era largely took shape in decisions made between May 1940 and December 1941, argues Kershaw (Hitler, 2000, etc. ), who outlines the ten most important of them. Adolf Hitler made three of them: to attack the Soviet Union, to declare war on the U.S. and to launch the Holocaust. In the matter of the first, Kershaw suggests that Hitler may have boxed himself in: Ideology and strategy combined to require an effort to do away with Stalin’s regime quickly so that the Third Reich could expand southward and face the U.S., which was sure to land in Europe someday. Even though it got Moscow in its sights, Hitler’s Russian campaign failed as Napoleon’s had, thanks in some measure to the brutal winter. But Hitler would forever blame another of the ten decisions Kershaw outlines, namely Benito Mussolini’s supremely misguided ploy to invade Greece, which resulted in one of many Italian defeats. Hitler asserted that “but for the difficulties created for us by the Italians and their idiotic campaign in Greece…I should have attacked Russia a few weeks earlier.” Hitler’s two-front war was threatening and massive enough that one of England’s key decisions was simply that of continuing to fight on rather than sue for peace, while one of those made by FDR was to carry on a sort-of-war without congressional approval until he could overcome his isolationist opposition—a political feat not really possible until Japan made one of its key decisions, that of launching the surprise attack on the U.S. Pacific fleet at Pearl Harbor. Kershaw blends an understanding of the blunt-force turning points of history with an appreciation for missed opportunities. Of much interest to students of the modern era.